Adam Thas has a new column where he tries to find the good in all the bad! If you want to go back to the archives of the F This Movie! podcast, you will find that in our “Best and Worst Superhero Movies” a few of us ranked Mark Steven Johnson’s 2007 Ghost Rider as one of the worst ever. 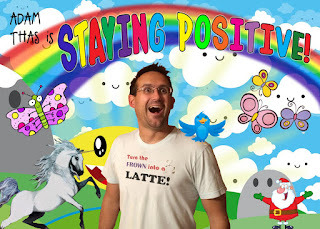 Spoilers: It’s still pretty bad, but this is about staying positive, so let’s break out the rainbows, unicorns, and pizza and watch 2007’s Ghost Rider. Once you get past the voice over, the beginning is a step above good. We have the story of Barton and Johnny Blaze, father and son sideshow carnies who perform motorcycle stunts in rural Texas. For the most part, this works in the context of the movie. Early on, Ghost Rider wants to make connections to campfire ghost stories, and the first 20 minutes totally works in this aspect. The story of a boy who sells his soul to the devil to save his father is a great premise, and the ending to this first segment gives a lot of hope for what the rest of the movie is going to become. Quickly, though, Ghost Rider becomes a different movie, as we see the young Johnny Blaze all grown up and being played by Nicolas Cage. Once again, though, I’m a fan of the concept (and Nicolas Cage). 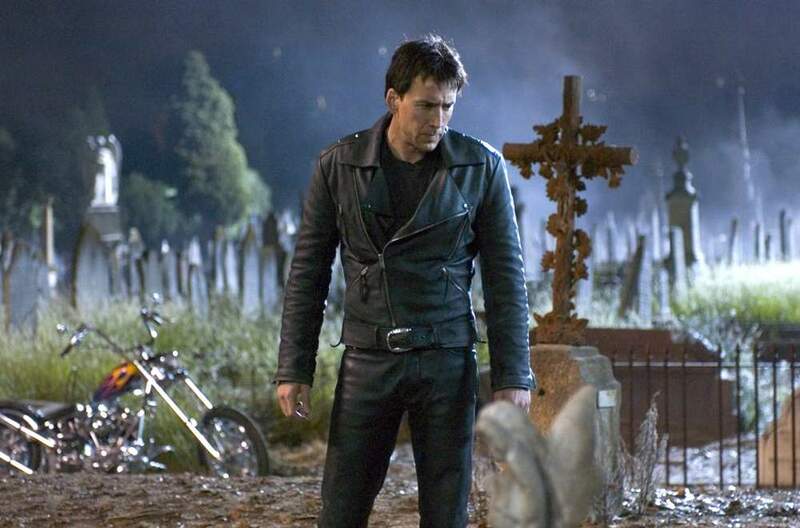 Johnny knows that “The Devil” wants to keep him alive, so does increasingly dangerous stunts knowing that his curse is going to keep him alive. Upon re-watching Ghost Rider, I realized "turning a negative to a positive" is the underlying theme throughout the movie. While it doesn’t work and is glossed over most of the time, the fact that the script even has a theme is something that I can applaud. As silly as it is, though, I find the hardest thing for me to accept was the celebrity status assigned to a motorcycle stuntman. Ghost Rider saw his first appearance in 1973, while Evel Knievel was still selling thousands of tickets in the Astrodome, but this is 2007 and the idea of a famous stuntman just puts a giant roadblock in the movie. I know -- it’s a movie about a motorcycle riding spirit of vengeance and my biggest issue is that the stuntman is famous probably makes me a crazy person. Upon watching it again, the fame still bugs me, but does manage to fit the “folklore” tone that Ghost Rider tries to frame making it a bit easier to swallow this time around. If I’m really going to step back there are a few good performances in the movie. Donal Logue is fine as Blaze’s best friend and is likeable enough that I think he deserved a better exit from the movie than the one that is given to him. Even though his entire purpose in the movie is pointless, Sam Elliot is fine doing exactly what he’s been doing for his entire career. The two best things about Ghost Rider are Peter Fonda and Nic Cage. Peter Fonda plays Mephisto, or “The Devil,” and while he isn’t given much to do, he demands all the attention whenever he’s on screen. For a character that has been played thousands of time in movies, he does a great job of just looking and feeling creepy while also being the smartest guy in the room. The second time watching it, though, Nic Cage is great, at least for the first half of the movie. He does a good job at making a VERY uninteresting character in Johnny Blaze into a moderately entertaining character. 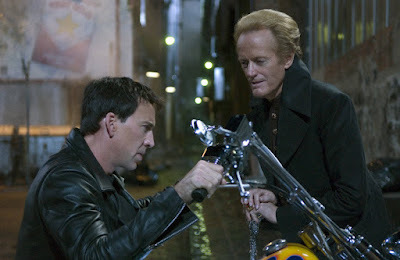 One third Elvis, one third Evel Knievel, and one third Nic-Cage-Crazy, he’s by far the best thing about Ghost Rider. Some of his best scenes are him by himself, and even though it gets a lot less interesting once Ghost Rider shows up, I could watch his transformation scenes over and over again. It’s almost like Cage watched every werewolf movie ever made, sat back and said “That was too tame.” The biggest compliment I can give to Cage is that he still remains fun even after having to play opposite of Eva Mendes. 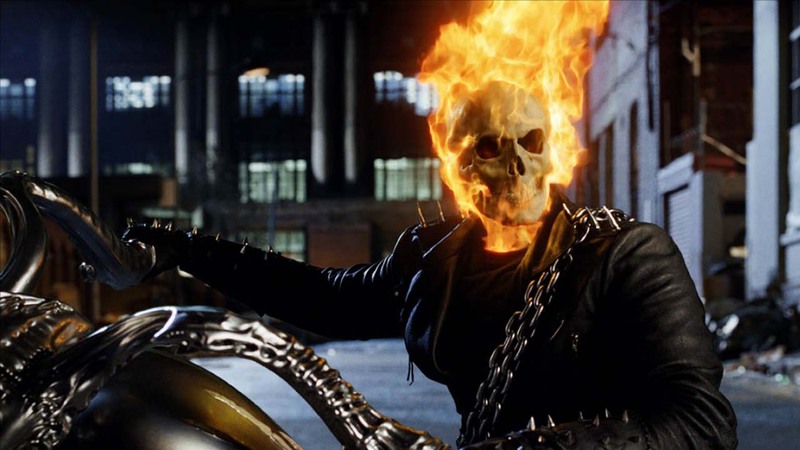 At about the halfway point, Ghost Rider loses most of the good that it had established during the first half of the movie and falls hard. Ghost Rider is not a good movie, but I’m here to stay positive, so let’s find a way to end on a positive note. We did the podcast on Superhero Movies years ago and since then Hollywood has given us movies like Fantastic Four (the reboot) and The Amazing Spider-Man 2, so the question should be if I would still put it on the top of the “bad” list? I can confidently say “NO.” Much like trying to set your friend up with one of your ugly friends, I’m going to dig deep into the “personality” bucket and say Ghost Rider has a good personality, enough to leave it just sitting above the bottom of the barrel. I like this concept. I don't think it'll get me to revisit Ghost Rider but I'm about to google that transformation scene fo' sho! I'm not kidding, those transformations might be some of the best I've ever seen with the Cage-Crazy in full gear. Hahaha, I'm sorry, your post had me wanting to watch it again. It's so great. Great column Adam! My memory of this movie is nothing but disgust, but you may have convinced me to watch it again with your happier lens. Granted in an hour this may seem like a horrible idea and I might not ever see this movie again. Either way I think I'll be fine. Whoa, whoa, stop the clock! It's better than I remembered but there is still a good chance you're going to want to stab me. Also, thank you, I'm glad you liked it! Ghost Rider: Spirit Of Vengeance is an insane delight. I don't remember anything at all about this one though. I like this one too I mean, I don't love it, but it IS Ghost Rider, and it has that really awesome scene where Nicholas Cage's Ghost Rider and Sam Elliott's Ghost Rider travel side by side to cool western music. I revisit this one every few years, which is usually enough. This movie came out when I was 14 and I like it. Even though I knew full well it was VERY MUCH NOT GOOD. 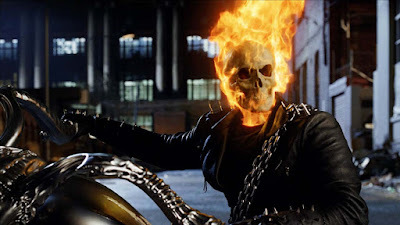 I just loved Nic Cage and the character of Ghost Rider in general. My main annoyance with the movie (besides Eva Mendes who is never ever cute or charming except in Hitch) is that the second half's plot is completely set up like a video game. He just moves from bad guy to bad guy like he's accending levels until he gets to the boss fight. And to this day every time I see Wes Bentley not give a horrible performance I am completely shocked... because of him in this movie. My favorite quote: "Forgive me Father for I have sinned... I've sinned a lot." My great hope for Ghost Rider is that he'll get an R-rated movie/netflix show starring Dan Stevens as Johnny Cage. Love this column! Love the idea for this column! Even though I absolutely enjoy it when the podcasts and columns devolve into a mockery fest, I think of this place first and foremost as one of positivity. I've stayed away from this movie because of its reputation, but I might just watch it to see how it looks compared to more recent bad superhero movies. Plus, crazy Nic Cage? How can anyone say no? I love the concept, and pucture, of this new thread Adam! I have an interst in watching this movie but I am not sure. I think I will end up watching it. At least it has some good points. Unlike some truely awful movies I have, for some reason, chose to watch this year!